Tasmin Little is perhaps most frequently associated with music of the twentieth and twenty-first centuries. She made her Proms debut in 1990 with the seldom-played violin concerto of Leoš Janáček; she’s one of the few violinists to perform Ligeti’s concerto; she has recorded concertos by Szymanowski and Karłowicz (with Edward Gardner and the BBCSO), as well as works by Britten, Delius, Bridge, Ireland, Bliss and Walton; and she has given premieres of concertos by Robert Saxton, Dominic Muldowney and Stuart MacRae among others. Here, though, the violinist was firmly on nineteenth-century ground, presenting music for violin and piano by Brahms and Schubert, with her long-term collaborator, pianist Piers Lane. The duo have recorded these works on the Chandos label: their disc of Schubert’s violin and piano works appeared in 2015 and they released a recording of Brahms three sonatas last spring. And, these were assured and flowing performances, Little’s 1757 Guadagnini filling the hall with refulgent colour and strength. Lane’s piano part, never an accompaniment, had real character and vivacity, and judicious use of the pedal created lines of great fluency and transparency. Indeed, the whole recital was characterised by musical clarity and immediacy, and both musicians exuded composure and evident enjoyment. The way that Little can modify the tone-colour of her Guadagnini to bring out every nuance and intimation is notable, and her playing in the opening Allegro was purposeful and well-shaped. The long lines of the first theme were both song-like in expanse and infused with fervency, but though they created strong momentum the duo were not afraid to hold back the tempo at times which, along with the clarity of Lane’s figuration, created a welcome spaciousness. Both the opening G-string melody and the soaring thirds of the Adagio resonated warmly. Little showed strong musicianship in the way that she built the intensity of the successive peaks and there was a lovely sense of freedom and breadth as the movement gently came to rest. The Un poco presto e con sentiment was restless in spirit and swept almost segue into the Presto agitato which was played with great power and majesty. The other work by Brahms was the Scherzo of the so-called F-A-E Sonata, which opened the second half of the recital with a tempestuous flourish, the violin’s open G triplet establishing the motif which would press through the movement. Again, though, the contrasts of temperament were skilfully crafted, the brief trio offering some gentle respite. The concert had begun with the second of the three sonatas that Schubert composed in 1816 when he was just nineteen years of age. Here, Little used vibrato more sparingly and, combined with her focused tone and immaculate intonation, this created an almost Mozartian grace. Lane imbued the piano’s prelude with a sense of anticipation which was fulfilled by the violin entry in the Allegro moderato and throughout the piano was alert to the music’s dramatic nuances and passionate outbursts. Though Little’s tone was sweet and true, I thought that the Andante was a little rushed; the phrases seemed to me to need more time to breathe. But, the agility of Little’s bowing in the Menuetto was impressive and the Trio in particular had a lovely Romantic flow. Throughout the sonata, the duo sought and found the ‘drama’ in Schubert’s music, particularly in the agitation of the central section of the final Allegro. Schubert wrote his Fantasy in C D934 to show off the virtuoso technique of the Bohemian violinist Josef Slavík, who premiered the Fantasy with pianist Karl Maria von Bocklet in Vienna in January 1828. And, there certainly was considerable virtuosity on display in the sparkling variations on Schubert’s much-loved song, ‘Sei mir gegrüsst’ (I greet you), in the latter part of the Fantasy, as well as bitter-sweet lyricism in the presentation of the song’s yearning theme. But, it was the combination of an unwavering attention to the details allied with a coherent conception of the whole which was most impressive about this performance. Whether it was the delicacy of the piano’s tremolandos at the start of the Andante moderato, the precision of Lane’s trills supporting Little’s lied-like melody, or the dancing staccatos of the two instruments as they raced each other in canon in the Allegretto, each mood and manner was precisely defined. Racing scales, octave leaps, hopping string crossings: all were immaculately played. This was a true collaboration, and the duo displayed sustained like-mindedness as they moved seamlessly through Schubert’s complex structure with persuasiveness and poise. An injection of tension with the return of the opening material showed their appreciation of the work’s innate drama, and their shared enjoyment as they stormed through the concluding Presto was obvious. Piers Lane, who celebrated his 60th birthday on Monday with a sell-out piano recital at the Wigmore Hall, came to London from Australia four decades ago. And fortunately for us he never left. Lane has a formidable technique, a remarkable memory and sophisticated interpretative insights, all of which were brought to bear on music that, for the most part, eschewed the romantic stuff for which he is best known in favour of more classical pieces. This recital was inspired by the legendary Dame Myra Hess and reproduced her first wartime recital at the National Gallery, with two sonatas by Scarlatti, two preludes and fugues by Bach, Beethoven’s Appassionata Sonata and two Chopin nocturnes. Lane (above) is a much-loved figure in British music, and it was touching to see so many distinguished musicians turning up to cheer him on, including the violinist Tasmin Little. The Scarlatti and Bach were beautifully turned, and the Beethoven – albeit in the first movement maybe a bit over-pedalled – displayed to the full Lane’s remarkable power and personality. And they have done numerous recitals and recordings since, including an ongoing series for Chandos of rarely heard British violin sonatas, which pay tribute to Lane’s devotion to the neglected music of his adopted country. Also present was actress Dame Patricia Routledge, another Myra Hess enthusiast, with whom Lane has done almost 80 recitals the length and breadth of the country, where he plays some of Hess’s favourite pieces, while Routledge reads from her letters. Perhaps the only disappointment in an exhilarating evening was the concluding work, Rachmaninov’s Variations On A Theme Of Chopin. This formidable piece was another tribute to Lane’s prestidigitation but the young Rachmaninov’s musical substance here couldn’t compare to what had gone before. However, all was forgiven with the last encore – Dudley Moore’s Beethoven parody, with the principal melody from the Colonel Bogey March (you know the one) and a coruscating Beethovenian conclusion that keeps on refusing to end. Truly hilarious. If you don’t know it (and I didn’t), do go to ‘Dudley Moore Beethoven’ on YouTube for some real fun. Brett Dean and Piers Lane set the concert hall ablaze. Ethereal wisps from the strings crept like mist across the opening of Sibelius’ Scene with Cranes, music extracted by the composer from the score he wrote for his brother-in-law Arvid Järnefelt’s symbolist play Kuolema or Death. The sound conductor Brett Dean coaxed from the Sydney Symphony Orchestra’s strings was delicate, almost prayer-like, before rising intensity disturbed the titular cranes – clarinettists Francesco Celata and Christopher Tingay – perched above the orchestra in the choir stalls, their plaintive, descending cries ringing out mournfully. Dean, fresh from conducting his powerful Dream Sequence concert with the SSO at Carriageworks on Sunday, pushed deep into the silences of Sibelius’ music, leading with sensitive restraint and authority, while guest concertmaster Natsuko Yoshimoto traded lean, haunting lines with cellist Umberto Clerici. Similarly, it was a powerful impression left by a natural phenomenon that inspired the second work on the SSO’s Rachmaninoff on Fire programme, Dean’s own Fire Music, which turned the wisps of mist to acrid smoke. Wrought in the aftermath of the devastating Black Saturday bushfires that burnt across Victoria in 2009, Fire Music opened with ominous rumblings and a deceptive hiss of soft-edged white noise that filled the hall and ringed the audience. Small groups of players were positioned left and right at the back of the hall, creating a claustrophobic surround-sound effect that hemmed anxious listeners in. The work followed Scene with Cranes without break or applause, building and expanding the charged atmosphere created in the Sibelius. Dean’s command of the orchestral palette is both inventive and virtuosic – Fire Music is no exception. He conjured a vivid harmonic heat haze from trilling winds and muted brass. Sparks flew from the percussion while waves and gusts of sound blew from snare drums and string flurries. Stephen Lalor’s distorted electric guitar, balanced carefully as a solo orchestral voice, cried out in the chaos while the lower brass smouldered and a spot-lit string quartet above the orchestra played a melody that rocked on the edge of madness. While fire was merely the starting point for Dean before the music became its own fuel, the horror of bushfire and its effects was never far away, making itself heard in popping percussion, distant bird calls and the sounds of what could have been fleeing, scurrying animals (a perception primed by the juxtaposition with Sibelius’ dream-state idyll). Against the gentler, intimate Scene with Cranes, this was the apocalyptic music of fearsome natural phenomena – vast weather patterns, thunderstorms and fires – a searing musical experience to leave you feeling scoured. A hard act to follow then for pianist Piers Lane, who joined Dean and the SSO for Rachmaninov’s formidable Third Piano Concerto. But from the surging strings and distinctive folk-like melody of the opening, which Lane delivered with simple clarity, the excitement only escalated. Rachmaninov wrote this Concerto for his American tour, giving the first performances in New York in 1909 (one of the early performances was conducted by none other than Gustav Mahler at Carnegie Hall) and, thanks in part to the advocacy of Vladimir Horowitz and its later use in the film Shine, it has now become one of the most well-loved (and perhaps feared) concertos in the repertoire. The technical challenges were water off a duck’s back for Lane, however, who brought a deft, firm-yet-agile touch to the Concerto, but also a beautiful sense of the work’s architecture. He teased melodies out of the virtuosic storm of notes with precise clarity, masterfully weaving them into a larger tapestry, throwing the heavier late Romantic pianism into stark relief with sweetly sculpted lighter moments. He glittered against Emma Sholl’s sonorous flute in the first movement’s cadenza and injected the work’s quirkier moments with capricious humour. Diana Doherty’s oboe solo in the second movement was a highlight before Lane’s sparkling trill spun off into lush soloing. He fired off biting accents against the brass, duetted with the full-toned strings and he and Dean found a balance between piano and orchestra that hit the sweet spot in terms of exciting tension, without ever tipping too far in one direction or the other. The Concerto’s heroic finale became a triumphant, cathartic climax that had been slowly building, it seemed in retrospect, not just from the first movement but from the opening notes of the concert itself. With the orchestra in top form, a cleverly curated programme and a stunning soloist, this was a spectacular concert – orchestral music at its best – and the audience fed off that fierce energy. They roared as Lane sat down for an encore, Moritz Moszkowski’s rippling Étincelles Op. 36 No 6 (also a favourite of Horowitz) aptly, for this concert, titled Sparks. The vivid performance that followed was cinematic and notably the engaged woodwind sang out, their tone sailing distinctively above the orchestra to the front of the sound stage. The impressive lower strings were very much on song. Diemecke commanded satisfying moments of repose. The concert’s emotional opposites resided in Moskowski’s uplifting exhilarating Piano Concerto No 1 in E Major and Dvořák’s darkly brooding Seventh Symphony. Piers Lane, a self-confessed champion of neglected music, was in his element as soloist for the Moskowski. This work enjoyed plenty of attention in the composer’s heyday, but for decades it gathered dust until Lane, especially, gave it pride of place in his repertoire and restored its status as a viable concerto. Lane’s fingers travelled at the speed of light, flew up and down the keys, thundered in the double octaves and propelled the music’s dazzling rapid flurries and spectacular pianism in style. Lane’s brilliance was charged by insightful scholarship and an affinity with Moskowski’s breezy romantic syntax, which bears the imprint of Rachmaninov and other composers from the Romantic period who brokered showy pianism. Lane’s phenomenal technicality was powered by acute rhythmical precision and emphatic light and shade. He mined the playfulness, cherished the tunefulness and not only fired his own contribution but seemed to shepherd the orchestra’s too. Diemecke was respectful and gave Lane space and artistic licence. If the concerto scaled exuberant reaches, Dvořák’s Seventh Symphony, regarded as the best of the composer’s symphonies if not the most popular, plumbed emotional depths. in this enjoyable programme resided in the triumphant shaping of the more extensively rehearsed Dvořák. Highlighting the universal themes and the confessional moments convincingly, he juggled these oppositional elements and successfully framed the Slavic composer’s grand architecture. He pushed the orchestra to its limits, inspired confidence and drew the best from individual players and sections. The French horns and brass were exceptional. The stars were brightly shining for Piers Lane’s illuminating Chopin recital at Wigmore Hall, a neatly planned programme enhanced by the audience respecting the pianist’s request for no applause until the respective halves had finished. Lane opened with an inviting and dynamic A-flat Impromptu, given with an ink-still-wet capriciousness, whether expressing flights of fancy or lyrical asides. The great Fantasy was full of gravitas, a spacious account sure of its direction. The march-section (which recurs) was perfectly judged – considered, the hands equal partners as they should be, and not getting faster (Małcużyński my yardstick here, Lane joining such exalted company) – and whether thrilling or in deep contemplation, Lane gave a comprehensive reading. Following which the sad Study was anointed with innate tenderness as well as emotional burgeoning, then the Ballade mixed lyrical entreaties, rhythmic teasing and drama, and the first half concluded with the most-elusive of the Four Scherzos, Lane’s dexterity and sensitivity true to the piece’s contrasts, sharing its secrets with us without making them obvious. Following the interval, and also judged to a nicety, was the Opus 44 Polonaise, ominous at its opening, quite Lisztian for a few bars, and soon weighty and majestic, as befits this particular dance, and becoming dreamy in the middle section without losing threads; this may not be the ‘Heroic’ Polonaise (that’s opus 53) but Lane gave it a valiant outing: in a concert that was all highlights, this performance may have been the ‘first among equals’. From public display to the privacy of the Mazurka – compassionate, fleeting, captivating – followed by the pair of Opus 62 Nocturnes, songs of the night, the first siren-like in its allure, the second of moonlit rapture, both spellbinding. Finally the magnificent Barcarolle, wonderfully time-taken here, ebbing and flowing and leading to a real sense of culmination, with those magical bars of reminiscing exquisitely shaped and touched, quite beguiling, and the fortissimo finality the equivalent of coming out of a reverie. Chopin also provided the two encores, the E-flat Nocturne (Opus 9/2), ravishing, and ultimately the C-sharp minor Waltz (Opus 64/2), again with thoughtful measure on its side, with room to quicken, Lane’s old-world charm a pleasure (reminding of Cherkassky, Cortot, Moiseiwitsch, Rubinstein, and others). This was an altogether special evening. IT would be unfair to the pianist to say that the piano was the star of the show, but there was no ignoring the impressive presence of a brand new Bosendorfer instrument framed in the window of UKARIA’s recital hall. It’s a bit wet behind the ears and hasn’t lost its baby teeth yet, but it is a big improvement on the instrument that was previously there. It will no doubt mature into an even better piano in a year or so. Beyond a certain time pianos do not get better with age, but fortunately pianists often do – or at least their longevity far exceeds that of their instrument. Piers Lane certainly demonstrated that in this fine recital. I’ve heard him many times and I’ve never heard him sound better. He began by testing the piano’s Viennese credentials with Mozart’s Sonata in B major, an elegant, lively, straightforward performance. It certainly didn’t prepare us for what followed – in Beethoven’s Appassionata Sonata he plunged headfirst into the heart of the maelstrom. This was playing of dizzying intensity, holing nothing back. The calm of the slow movement only served to emphasise the wildness and abandon of the two outer movements; in the intimate environment of this recital hall it was like confronting a force of nature head-on. After interval came seven of Carl Vine’s Anne Landa Preludes, short, witty pieces that draw on many different currents of modern piano music from Debussy to Prokofiev and (possibly) boogie-woogie. They’re not easy, and Piers Lane gave a brilliant account of them. In Chopin’s Ballade No. 3 Lane followed a tradition traceable back to Chopin himself, finding inner voices in the piano writing to bring to the fore; in his Chopin Nocturne encore he followed another tradition, adding subtle, tasteful embellishments to some passages. Lane capped this very enjoyable recital off with Liszt’s evocation of Venice and Naples, concluding with a crazy Tarantella adorned with preposterously difficult passages, leaving one torn between laughing out loud at the silliness of it all and sitting silently gobsmacked by Piers Lane’s dazzling virtuosity. The ideal duo partnership is more than the sum of its parts. The two musical personalities don't merge, exactly, but balance, complement and inspire each other to create a performance that enshrines the qualities of both artists - and still sounds like it sings with one voice. That's exactly what we got from Tasmin Little and Piers Lane in César Franck's Violin Sonata, the climax of this lunchtime recital at Birmingham Conservatoire. It's too simple to say that Lane's piano embodied the dark and Little's violin the light side of Franck's masterpiece. Both shared the same ability to charge a repeated sequence of notes with mounting emotional intensity, both understood instinctively when to make a phrase growl or gleam. But even at its most tranquil, an undercurrent of passion drove the whole performance. Franck's runaway accelerandos and torrential outbursts of emotion have rarely sounded more natural or more necessary. Earlier, the pair had dispatched Brahms's FAEScherzo in a single symphonic sweep, and made a poetic case for Szymanowski's neglected D minor Sonata. Lane colouring his staccato chords to emulate the texture of Little's pizzicato, and Little spinning delicate golden tracery in the skies above. And as an encore, they pulled out an exquisite, recently rediscovered miniature by William Lloyd Webber - father of the Conservatoire's new principal. It was enough to make you forget that you were in the grotty old Adrian Boult Hall. With artists of this quality and a sizeable and enthusiastic audience, there was no better demonstration of the promising new spirit that seems to be blowing through the Conservatoire. "The Franck Violin Sonata in A is however extensively recorded and performed – and rightly so. Although scored in four movements, the divisions all stem from the opening theme of the Allegretto, embracing a story that both artists told with conviction and eloquence. I loved the way the emphasis switched between violin and piano: Little and Lane equal in every respect, musical partners idyllically sharing lead and accompaniment." "It is difficult to think of a pianist who excels Lane in this kind of repertoire. He has a very large technique, and a beautiful quality of tone, both of which are put at the disposal of acute sensitivity to the particular demands of English Romantic music. His phrasing in the many reflective passages of Ireland’s concerto was both exquisite and warmly projected, and the virtuoso passages were ideally realised." "Ireland is an unjustly neglected composer and an exemplar of what has come to be known as “Romantic Modernism”: the thesis being that English composers of the Thirties were discreet modernists with deep roots in the 19th century. The slow movement of Ireland’s Piano Concerto is unashamedly Romantic and Piers Lane, who has long been a persuasive advocate of the work, realised its lyrical introspection irreproachably. He and conductor Andrew Manze were also alert to the more modernist outer movements, which remind one of Ravel’s sparky and contemporary G-major Concerto, although patriots will be glad to note that our man’s work was premiered first by two years." "Completely at home in the idiom, the London-based Australian pianist made the strongest possible case here under the equally attuned baton of Andrew Manze. But once past the smooth opening motto theme, the piano quickly settles into a sort of high-class hotel-lobby style. Some passages of rhapsodic musing lift things a little, and the music takes off briefly – here Lane caught the glittering jauntiness with panache. Yet the slow movement is not so much calm as becalmed, and the finale sounds like Stravinsky at the county fair. Still, given the conservatism of most London orchestral programming, this was a welcome curiosity." "John Ireland is best remembered as a miniaturist, but his Piano Concerto is a substantial work of 25 minutes duration. Even so, its material is slight and its expressive range limited, but it never outstays its welcome, combining the idiomatic solo writing that only a virtuoso pianist could pen alongside skillful orchestral writing, always imaginative, if within conservative bounds. Piers Lane (pictured below) gave a convincing performance (from memory – particularly impressive in a work this obscure) and proved the ideal partner to Manze. Like the conductor, he never indulges in romantic excess, but he does push his rubato and phrasing swells just a little further than Manze would – a constructive tension. Ireland writes long, lyrical lines for the piano, which he punctuates with brief snippets from around the woodwind and brass sections, all over a carefully orchestrated bed of strings. The sheer skill with which the orchestral part is contrived means that the orchestra can hardly go wrong (the composer’s conservatism in instrumentation was graphically demonstrated through comparison with the Walton in the second half), but the combination of engaged playing, from orchestra and soloist alike, and disciplined conducting, added up to an ideal rendition. The work itself is no neglected masterpiece, but if each of its occasional outings is as good as this, it will always be worth hearing." "Piers Lane is just the chap to safeguard those works that have presently gone onto the sidings and maybe even hit the buffers. One could criticise the loose structure of Ireland’s outer movements (especially the finale) and find both too rhapsodic, even discursive, but what adorable music – from the soulful opening onwards. Whether bluesy, dreamy (retreats into wonderland) or chirpy, with some jazzy harmony to spice things up, there is much to enjoy, especially with a pianist as genuine in his intentions as Lane. He played with conviction, commitment, poeticism and music-serving virtuosity, and from memory in a work that presumably doesn’t come up for him too often (although he has recorded it, for Hyperion) and with a slow movement that really is from the heart to the heart – intimate and wistful – raptly played by Lane and aided by responsive flute and violin solos, the music retreating to a very private place. Manze and the LPO offered a sympathetic accompaniment (Ireland was a considerate orchestrator) while suggesting the score as not being a total stranger." Do you have a moment for something musical? Piers Lane does. His latest Wigmore Hall recital was audience-full and attracted at least one fellow-pianist, Stephen Kovacevich. Piers Lane. Photograph: Keith Saunder The soulful Rachmaninov opener was played with dignity and much sentiment, consoling and transporting. The silence that greeted it was significant – magic had already happened – and allowed Lane some valuable seconds to prepare for the Opus 23 set of Preludes, given virtually continuously, creating one big multifarious work rather than ten short ones. The introspective No.1 (F sharp minor) was followed by the barnstorming B flat, heroically delivered. If all ten Preludes were given by Lane with much insight and illumination, some were especially distinguished: the lullaby of the D major (No.4) was immaculately voiced and rapturous; the succeeding march of the G minor enjoyed panache and militaristic deliberation; then came the expressive ripples and sensuous harmonies of the E flat (No.6); and this was succeeded by the dazzling dexterity needed for the C minor. By the time of the Tenth (in G flat), we had reached wrap-up time. In such an enthralling setting, this Prelude seemed more a postlude, a nostalgic envoi as well as an inward summation of what had preceded it. The last of Schubert’s Moments musicaux occupies a similar position in relation to its five brethren. Lane played it most beautifully, with the finest of feelings and also with inviting intimacy. A shame then about the undisguised coughing that scarred this touching piece: on this occasion the Wigmore Hall’s regular request to switch off mobiles and keep coughing at bay was not given. Following this touching miniature, those with bronchial problems went on to share them big-time, seemingly unsettling Lane as he readied himself for further Schubert, this time an epic Sonata. Lane’s account of the first movement of D959 was rugged, active and malleable, eloquent when required, but it was disappointing to lose the exposition repeat, both for itself, to retain the music’s grand scale, and in relation to the extent of the movements that follow. It was compelling though, and the coda, which here seemed to look-back to Beethoven’s ‘Tempest’ Sonata, was fascinatingly impressionistic. With Schubert nearing the end of his life, bowing out aged 31, the succeeding Andantino seemed death-haunted, funereal in its tread, and Lane conjured a superbly tempestuous, clangourous and even vehement middle section. After which the scherzo was impish and light-hearted, flexible and gruff too, the trio a hopeful hymnal. For the expansive finale, Lane gambolled its country-walk gait ideally, judged perfectly its gathering strength and increasing pace, easing back seamlessly for returns of the opening idea, and then boldly crowned the coda – and its full-circle return to the Sonata’s very opening. As he had done for the Rachmaninov, Lane gave us an exhaustive performance of D959, his innate involvement clear to hear. He wasn’t done, for there followed Chopin’s D flat Nocturne (Opus 27/2), a little too up-front at first but soon withdrawing to the subtle fragrance and adornment of the night. Whether fastidious or flamboyant, and what lies in between, Piers Lane is always at the service of the music, investing much personality into it ... and fortunately for longer than just a moment. Ending a year of many very satisfying ‘moments musicaux’ at the Wigmore Hall in 2014, pianist Piers Lane juxtaposed musical miniatures with more luxuriant forms, highlighting the contrasts between the yearning soulfulness of Rachmaninov with the robust dynamism of Schubert as well as the pianistic eloquence which the composers have in common. The recital was notable for Lane’s sustained interpretative probing as much as for the pianist’s technical assurance and attention to musical detail. Thus, Rachmaninov’s Op.23 Préludes (1901-03), each of which embodies a distinct mood or character, proved a perfect vehicle through which to demonstrate the breadth of Lane’s expressivity. In the first F# minor Prélude, the shadow of Chopin hung over the mournful melody while the chromatics of the left-hand accompaniment were rich and dark, although significant motifs in the middle voices were clearly articulated. From the haunting pianissimo chords of the close burst the stormy Bb Prélude: the sweeping left-hand arpeggios drove forward vigorously in the outer sections, while the more lyrical central episode reversed the hands’ roles, transferring the melody to the tenor register and offering a brief respite before the stormy conclusion. The brilliant piano writing was embraced with confidence and energy, and there was a wonderful brightness to the busy passagework and cascades. Lane effectively brought forth the march-like character of the D minor Tempo di minuetto which follows, using a light touch to summon a military staccato and making the texture feel quite spare despite the complex musical dialogues. The fourth Prélude sang pensively and serenely. Here Lane conjured the spirit of the Second Piano Concerto, which had received such a successful premiere in 1901, thus removing the cloud of depression which had troubled Rachmaninov since 1897. Indeed, this Prélude seemed redolent with the composer’s love for his cousin, Natalia Satina, whom he married in May 1902, the ascending melody aspiring towards a radiant upper register. But, although little tension troubled the contentment, Lane did urge the music forward, emphasising dramatic contrasts and employing astute rubato even while the accompanying arpeggio patterns were even and fluid. Tranquillity was brusquely swept aside by the pounding rhythms of the G minor march. In this fifth Prélude, Lane had the physical stamina to sustain the difficult chordal repetitions and also conveyed the yearning quality of the slower middle section. The Nocturne-like sixth Prélude in Eb was full of joy, but the dynamics were quite restrained, the mood intimate, preventing the expressive melody from becoming too saccharine. The complex figurations of next three préludes confirmed Lane’s technical prowess: after the tense agitation evoked by the rippling theme of the seventh (C minor), the challenging broken chords of the eighth (Ab) were surprisingly relaxed, while the fiendish passagework of the ninth (Eb) glittered. In the final Prélude Lane demonstrated his ability to balance a singing tone quality with expressive restraint and subtlety. The melody expanded beautiful from its initial middle-register compass, seeming to prepare for a more passionate conclusion, before slowly fading into repose – a satisfyingly contented ending to the set. The Préludes had been preceded, without pause, by the third of Rachmaninov’s Op.16 Moments musicaux (1896) in which the rhythmic flexibility of the alternating triplets and quavers in the melody captured the yearning quality of this miniature. The dynamics ebbed and flowed expressively, and the intricate passagework was cleanly articulated; the short piece was a perfect ‘drawing of breath’ before the Op.23 set, revealing a composer’s early search for a distinct personal voice which would come to fruition in the later Préludes. Schubert’s Moments musicaux D.780, composed between 1824 and 1828, do not have the same ‘prefatory’ relationship to the three major piano sonatas of the composer’s last year. But, the sixth piece (1824) is full of the characteristic and idiosyncratic harmonic surprises which confound the listener’s expectations in the A major D.959 sonata, as well as sharing the later work’s contrasting moods and tonalities, warmth giving way to wistfulness. Lane’s intense concentration and attention to detail were again apparent here and it was a pity that the subtleties of his interpretation were at times marred by the outbursts of unrestrained coughing which followed the audience’s return to the Hall after the interval. The opening of the D.959 Allegro was dignified and stately, though always warm and appealing of tone, and Lane most effectively introduced a note of urgency through the chromatic transition to the second subject. The latter was beautifully lyrical and unhurried. Such contrasts provided tension and drama throughout the movement and further demonstrated Lane’s willingness to reconsider and reflect upon the musical material. I was impressed once again by the clarity of the voicing and the movement built persuasively to a majestic, broad coda. There was surprisingly tempestuous drama, too, in the ensuing Andantino, which began in dreamy contemplation with a sighing, rocking accompaniment, but later erupted in declamatory outbursts of astonishing violence and unrest. Thankfully, the waltzing lilt of the scherzo erased the anger of the preceding nightmare. Here, the clarity of Lane’s shaping of the melodic lines effectively pointed the motivic connections with material heard earlier in the sonata. The pianist had a very sure grasp of the complex structural relationships within the final movement Rondo, Allegretto, and the long movement, with its contrasting episodes and unexpected harmonic twists, was convincingly presented. The rondo theme itself had strong character, combining focus with tenderness, and the coda, with its restatement of the sonata’s opening theme was assertive and exciting. Another miniature concluded the recital. Lane chose as his single encore Chopin’s Nocturne Op.27 No.2 in D flat, adopting an unusually flowing tempo and racing through the adornments at times, but always playing with thoughtfulness and precision, and closing with gentle repose. It was further evidence of Lane’s sustained engagement with the musical material, his superb technical control and his ability to communicate eloquently. “Proving eminently worthy of his top billing, pianist Piers Lane gave a joyful and incisive account of Beethoven's Piano Concerto No.3. It's a pleasure to watch Lane, his energy firmly focused in marvellously expressive hands. His crystal-clear finger work produces bravura escapades across the keyboard while also lavishing care and attention on the simplest of melodies. Above all, a master class on the great Igor Stravinsky. One of Lane’s major strengths is his intelligent approach to interpretation. He’s a scholar as much as a dazzling virtuoso, in the same vein as the concert pianist Stephen Hough, another regular in this recital series. Lane’s acute knowledge brings depth to his playing and he has the gift to convey meaning in this succinct form. Rachmaninov’s Ten Preludes of Opus 23 are tinged with nationalistic Russian elements. Each of the Preludes captures the essence of this Romantic composer’s quintessential sound. Lane excelled in the first, rather mournful Prelude, painting the melody in glorious pastel colors. Luxuriously, significant notes within each chord shone through the dark textures. From these tender reaches, he lunged into a fierce delivery of the second, which favors bell-like effects and presents as a cyclonic storm. The Fourth suited Lane’s lyricism in its wistful Chopin-like celebration of a tune sailing over a liquid, yearning accompaniment. In the Ninth, Lane revealed its drama almost at the speed of light and the pianist’s formidable technique was shown to advantage. Finally, in the Tenth, he conjured the poetry of the theme and demonstrated his flair for making a tune sing out to the audience albeit in a whispered tone. The second half was dedicated to Schubert’s innovative Sonata in A Major, D 959. A juggernaut in its ambitious scale, it was written in the composer’s last few weeks and, with quotations from several of his major works such as The Wintereisse, it is said to reflect Schubert’s life as well as the human condition. Schubert’s Sonata is cyclically woven together by a complexity of melodic and harmonic strands. The work was an excellent vehicle for Lane’s skill in shaping structures and as an imaginative colorist of the melodic line. The conversational interplay between left hand and right hand convinced and the inner voices were imbued with luminous tone. There are those who regard Schubert’s music as repetitive. Accordingly, Lane was fastidious about deploying a variety of shading in reprising important material. This was especially so at the startling recapitulation in the first movement where the opening theme reappears. Through Lane’s beautifully detailed attention to Schubert’s architecture it was as if he took the listener by the hand for a guided tour inside the music. Medici International Piano Masterworks Series. Conservatorium Theatre, Brisbane. March 10. EVEN if you didn't know that Schubert was nearing death's door when he composed the Piano Sonata in A major, D959, this greatest of his three final sonatas gives every indication of a genius glimpsing the future, of his impending demise and of where music was heading after his untimely departure. Composed just three months before the 31-year-old succumbed to a cocktail of poverty, burn-out and syphilis, it's like a lifetime of experience, hope and terror captured in just 40 minutes of astonishing solo piano writing. And when Piers Lane launched into it in the second half of his latest recital in Brisbane's estimable Medici piano series, his willingness to follow each of the proto-expressionist mood swings became an alarmingly graphic realisation of Schubert's last will and testament. The slow movement, in particular, is simple in its means yet becomes so scary and beautiful in its lingering look at what lies on the other side. London-based Lane, more subdued in stage manner than his hometown crowd is accustomed to during his regular return visits, proved up to the formidable task of standing back and letting the dying man have his say. But when the middle section lunges into pure atonal panic, the starkness of the emotion was disturbing enough to require an M-rating. And so it went for the rest of this exceptional, unpretentious reading as well, the first and last movements filled with feverish energy as if reflecting the rising temperature of the composer's illness-ravaged body, and the third being part-Mendelssohn elfin scherzo and part-Mahlerian nightmare. What pleasure in sadness, hearing this masterpiece played with such clarity, intelligence and humility. Rachmaninov's Ten Preludes, Op 23, in the first half seemed almost bombastic in comparison, especially with every movement becoming increasingly virtuosic. But again Lane, who makes a specialty of this composer's concertos, avoided the obvious competition-style point-scoring in the big moments in favour of the creation of an unbroken narrative from beginning to end. A Toccata by Lane's father, two encores, then the Brisbane launch of this year's Australian Festival of Chamber Music, which Lane directs, rounded out a performance that once again demonstrated, for maturity and insight, there are few who can rival this poet of the piano. "...Piers Lane was a generous and tactful accompanist who complemented his partner while being careful not to eclipse him. From his gentle and emphatic playing in the quartet of Schlegel songs to his tripping delivery of the repeated chord figures in ‘Im Freien’ (In the open), Lane was as attentive to Schäfer’s idiomatic style as he was to Schubert’s delicacy and infinite variety. We should hear him in this repertoire more often." "...The Grieg Piano Concerto is a romantic work, both in its period style and execution. It is little wonder that it has featured in a number of movies, TV series and commercials over the years. Its appeal is in the sweetness of its melodies (some drawing on Norwegian folk tunes), and the richness of the harmonisation, both for piano and orchestra. Lane showed himself to belong to the great tradition of romantic pianists; he has written on Chopin and recorded for the series, The Romantic Piano Concerto. If the occasional note was blurred in the great sweeping arpeggios and chords of the faster movements, it was hardly noticeable given the empathy and musicality of the pianist. And, just to prove he was not precious about his prodigious talent, Lane’s encore was Dudley Moore’s famously ridiculous Beethoven Sonata Parody on the Colonel Bogey March that literally played on the composer’s multiple endings for his great works. It sent the audience into the foyers with tears of laughter. " "At the core of the latest Master Series concerts from the Melbourne Symphony Orchestra stood Piers Lane's reading of Grieg's Piano Concerto. This was an honest, sober account of a popular masterpiece. Lane showed consideration for the composition's melodic riches and its technical problem areas. Alongside his virtuosity and concentrated grappling with deceptively difficult passage-work, the MSO under chief conductor-designate Sir Andrew Davis gave Lane intelligent and willing support, from the gracefully shaped horn solo of Geoff Lierse to a corps of high strings that bridged the Grieg dynamic gamut from smooth to punchy with fine unanimity." ",...Following this, we were treated to the world premiere of Carl Vine’s Piano Concerto No. 2, with the piano solo being played with great aplomb by the Australian born pianist, Piers Lane, who brought a lot of colour to the evening, not only through his playing but also through his trademark multicoloured socks! ....Carl Vine wrote, ‘it is my distinct impression that Piers Lane is incredibly good at everything on the keyboard, so writing music for him brings a liberating sense of having unfettered reign over the instrument’. This was clearly evident from the music, as the piano part was far-reaching, encompassing a wide range of pianist techniques and colours, none of which troubled Piers Lane in the slightest. " 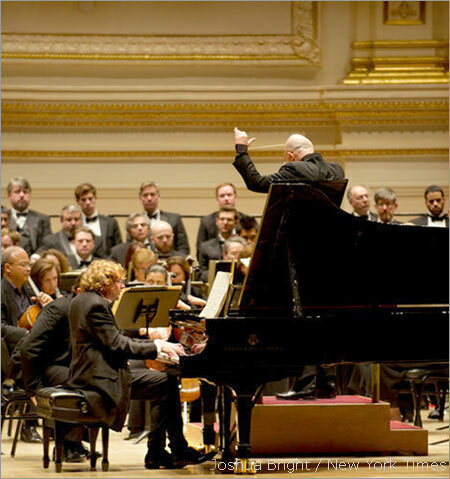 There was no need for caveats on Sunday afternoon when Mr. Botstein led his orchestra at Carnegie Hall in a program that brought together Busoni’s Piano Concerto in C (Op. 39) and Liszt’s “Faust” Symphony, two works that have vehement constituencies but are rarely heard because they are sprawling and, in the case of the Busoni, challenging for both orchestra and soloist. This concerto, which clocked in at around 72 minutes on Sunday (the program notes estimated that it should take 64 minutes; the timing in the published score is 80) offers a pianist relatively little time to rest, and most of that is in the last of its five expansive movements. Piers Lane, an Australian pianist based in London, seemed undaunted by its demands. His playing had everything this work requires: drive, athleticism and muscularity, certainly, but also lyricism and shapeliness where Busoni allowed room for them. Mr. Lane was particularly bracing in the fourth movement, “All’Italiana,” which begins as a tarantella and spins into a shimmering fantasy. on Sunday afternoon, led by Leon Botstein. Loud applause for Driver was assured as it was the next day for Husum’s regular, Piers Lane, (who scored additional points with Dudley Moore's Beethoven parody). Lane played two elegiac minor romances of Clara Schumann and three Nocturnes by John Field, Nocturne-inventor, with sensibility, while two further animated Clara Schumann romances were played in a more conventional manner. With intensive musicality, Lane shared his enthusiasm for the American Mark Saya, born in 1954, who in his Barcarolles has a sensitive-funny mix of the ingredients of the relevant barcaroles hits by Chopin and Offenbach. The 7 Preludes Revisited by Saya, felt more like experimental work in which Chopin Preludes, thinned postmodern, immersed under water, and read as negative images seem to be a serial explosion - an exciting encounter. After the break, Lane paid tribute to composer and pianist Percy Grainger, who died 50 years ago. His Bach, Richard Strauss and Tchaikovsky edits are very virtuosic transcriptions in an honorable tradition. By contrast the solo-edits of piano concertos of Tchaikovsky Abstracts (No. 1), Rachmaninoff (No. 2) and Schumann's appear rather absurd today. It's amazing how Piers manages to play all these quasi-three-handed pieces of sorcery - he does this with aplomb, and a lot of virtues and vices of traditional interpretation (Schumann!). Sure, one should hear this in Husum from time to time. But hearing it once is enough. Starker Beifall ist Driver ebenso sicher wie tags darauf Husums Stammgast Piers Lane (der mit der zugegebenen Beethoven-Parodie Dudley Moores zusätzlich punktet). Sensibel tönt Lane zwei elegische a-Moll-Romanzen Clara Schumanns und drei Nocturnes von Nocturne-Erfinder John Field ab, während zwei bewegtere Clara-Schumann-Romanzen eher zum Pauschaltarif erklingen. Musikalisch intensiv setzt sich Lane für den 1954 geborenen Amerikaner Mark Saya ein, der in seinen Barcarolles sensibel-witzig die Ingredienzen der einschlägigen Barcarolen-Hits von Chopin und Offenbach verquirlt. Weit experimenteller wirken Sayas 7 Preludes revisited, in denen Chopin-Préludes postmodern ausgedünnt, unter Wasser getaucht, als Negativbilder gelesen und zu scheinbar serieller Explosion gebracht werden – eine anregende Begegnung. Nach der Pause gedenkt Lane des vor 50 Jahren gestorbenen Komponisten und Pianisten Percy Grainger. Dessen Bach-, Richard-Strauss- und Tschaikowsky-Bearbeitungen stehen ganz in virtuos-ehrbarer Transkriptions-Tradition. Dagegen wirken die Solo-Kurzfassungen von Klavierkonzerten Tschaikowskys (Nr. 1), Rachmaninows (Nr. 2) und Schumanns heute eher absurd. Man staunt, wie Piers all diese quasi dreihändigen Hexereien hinkriegt – mit Aplomb und einer Menge traditioneller Interpretationstugenden und –untugenden (Schumann!). Sicher, man sollte so etwas in Husum auch mal gehört haben. Aber einmal reicht. Piers Lane, an ideal regular at the dances of the rare pianists to Husum, confronted his professional and knowledgeable listener community with an anachronistic by today's standards bravura Genus: transcriptions of "Classic Hits" from the witch's kitchen from Grainger piano. The top form Lane spread the piano versions of gems from Bach to Rachmaninoff, lingered appreciatively on sound refinements filigree motifs any exaltation of the symphonic apparatus in accordance with the original imagined. Previously they made the acquaintance with charming and lyrical nocturnes of John Field: lyrical indulgence thanks to the splendid touch culture of a versatile "Rarities" pianists this one Husum typical curiosity. Mark Sayas "Seven Preludes Revisited" as transformations of the famous Chopin Preluludes with the considerable entertainment value. Piers Lane, idealtypischer Stammgast im Reigen der Raritätenpianisten zu Husum, konfrontierte seine fach- und sachkundige Hörergemeinde mit einer für heutige Verhältnisse anachronistischen Bravourgattung: Transkriptionen von „Klassik-Hits" aus der pianistischen Hexenküche von Grainger. Der bestens aufgelegte Lane breitete die Klavier-Versionen der Pretiosen von Bach bis Rachmaninow aus, verweilte geniesserisch bei Klangraffinessen filigraner Motive imaginierte jedwede Exaltationen des sinfonischen Apparates gemäss des Originals. Zuvor machte man die Bekanntschaft mit bezaubernd-kantablen Nocturnes des John Field: lyrisches Schwelgen dank der famosen Anschlagskultur eines wandlungsfähigen „Raritäten"-Pianisten. Dazu eine Husum-typische Kuriosität: Mark Sayas „Seven Preludes revisted" als Transformationen von berühmten Chopin-Preludes mit erheblichen Unterhaltungswert. AUSTRALIAN-born pianist Piers Lane knew he was taking a risk by performing Chopin's 21 Nocturnes in one hit, particularly with Elisabeth Murdoch Hall lit only by aisle lights and candles on the stage floor. To forestall any signs of flagging concentration, he addressed his substantial audience between each opus-numbered group, offering a brief respite between each set of two or three pieces. Yes, the temptation to drift was seductive, particularly in well-worn nocturnes like No. 2 in E flat or the all-too-familiar A flat from Op. 32. But alongside those works that have become staples, you could go for years without hearing about half-a-dozen others. These rarities took on fresh life, particularly the adventurous last brace in B and E Major where the usual formal pattern obtains but the level of invention and daring exceeds anything that has come before. This bracket, alongside the concluding trio of posthumously published works, proved the night's revelation, Lane treating them with a subtlety of phrasing and rhythm that brought the cycle to a splendid conclusion. Throughout the event, Lane provided extra jolts by deviating from the usual path, interpolating mainly decorative ornamentation that Chopin authorised. These brief detours served the purpose of refreshing any jaded ears, although the audience was obviously moved by the experience of hearing this sequence of works that, fairly or unfairly, have come to represent the high Romantic era of pianism. The BBC Symphony Orchestra's Bohemian Rhapsodies is another series deserving attention, above all for its cycle of Martinu's five piano concertos. These are underrated works, so much so that Piers Lane's brilliant performance of the First Concerto is said to have been the first in Britain. Its contrapuntal clarity and drive, wit and vigour are reinforced under Petr Altrichter's baton. "Pianist Piers Lane comprehensively stole the show at the BBC SSO’s second Bohemian Rhapsodies concert on ­Thursday night with his dazzling, bustling, hustling and terrifically entertaining account of Martinu’s First Piano Concerto. Written in Paris in the 1920s, the motoric concerto chunters along irresistibly, exactly in the style of Bach’s Third Brandenburg Concerto, but with a wicked smile on its face and an alluring raise of its eyebrow. Even when Martinu goes a­wandering, as he does, the music is never less than endearing. Then Lane, having stolen the show once, set about doing it twice with a hilarious, roof-raising encore in the form of Dudley Moore’s outrageous and stylistically immaculate pastiche of Beethoven on the subject of the allegedly singular anatomical attribute of der Fuhrer. The house collapsed with laughter." "In between, and with some hilarity from Dudley Moore for his encore (last heard at the Wigmore Hall in April), it was good to hear Piers Lane in some mainstream repertoire (record collectors will be familiar with the rewarding byways he has given us), approaching afresh one of those ‘oh-no-not-again’ pieces, Lane imposing immediately through the rich sonorities he produced, an account of the solo part alternately heroic and sensitive, sometimes spiky, a creative but unmannered traversal well supported by the LPO and Vedernikov who conjured some ear-catching sepulchral textures from the cellos in the slow movement (fine solos here from Laura Lucas, flute, and Robert Hill, clarinet, just as there had been from John Ryan on horn in the first), the finale offering the most contrasted, even volatile, playing from Lane, the triumphant coda a bombast-free genuine point of arrival." Piers Lane in Perth - Concert Hall and Government House Ball Room. "... Later, we heard Piers Lane in top form as he brought infallible fingers and unflagging energy to what came across as unusually macho Mozart. I’ve not before heard the Piano Concerto K482 (or any other by Mozart for that matter) given such virile treatment. It is one of Mozart’s most brutally demanding piano scores – and Lane, firing on all musical pistons, was more than up to the challenge. This was as far from the Dresden-china-delicate, tinkle-finger school of Mozart piano playing as one could imagine. This was heroic, robust stuff that in less than assured hands might well have sounded grotesquely inappropriate. It’s a measure of Lane’s superlative musicality and musicianship that he brought it off in so triumphant a way. And the peekaboo insouciance that informed the finale was a delicious contrast to what had gone before. Bravo! On Sunday, Piers Lane came to Government House Ballroom. Whether in so hackneyed a piece as Mendelssohn’s Bee’s Wedding or enchanting the ear with a series of waltzes by Schubert – how rarely these little gems figure in recitals these days – Lane was at the top of his game with flawless fingerwork and an intuitive grasp of style. Brahms’ gigantic Sonata in F minor is not for timid pianists. It requires fearless fingers, great feats of memorisation and endurance to stay the course – and on all three counts Lane was beyond reproach. In the opening allegro maestoso, he negotiated ferociously difficult chordal leaps with majestic aplomb – and in the sonata’s more introspective moments, he mined the music for all its intimate subtleties. Lane did wonders, too, in navigating a sure way through the goblinesque moments of the scherzo. "Apart from the ubiquitous Bee’s Wedding, the second of the group of Mendelssohn Songs Without Words was lovingly fashioned, with a warm-toned legato line to staccato accompaniment. It was one of the gems of the afternoon. Of a bracket of Chopin Nocturnes, I particularly admired opus 15 no 1 in F; the melancholy beauty of its outer sections was impeccably essayed – and in the central episode Lane did wonders with its churning figurations. In the Nocturne in D flat from opus 27, which is some of Chopin’s most deeply probing music, Lane responded with an answering depth of feeling and the sort of cantabile tone that would surely have tempted even the grumpiest bird from a twig. Not the least of the pleasures of this recital was Lane’s linking commentary at which he is so inordinately skilled. He is one of the very few musicians who does this sort of thing very well unlike so many others whose progress to the microphone is observed with a sinking feeling. Lane romped through Schulz-Evler’s excruciatingly difficult take on Strauss’ Blue Danube and then brought the house down with Dudley Moore’s riotously funny Beethoven spoof played on the Ballroom’s magnificent new Fazioli grand piano." " ... By any standards, this Fazioli instrument is a magnificent piano and just the sort that’s needed for the increasingly frequent concerts given at this venue. It was altogether appropriate that the honour of ‘christening’ the piano was given to Lane, one of our most cherished musicians". "Edvard Grieg followed the Kodaly with his early “Piano Concerto in A Minor Opus 16”. Like Kodaly, Grieg echoes traditional folk music throughout his piano concerto. 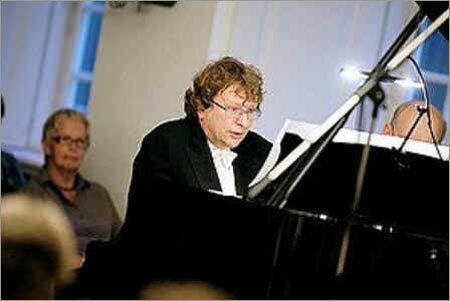 For this performance, guest pianist Piers Lane (pictured) played the dominant keyboard line. Lane is internationally acclaimed and was last seen in Adelaide at the Town Hall for Musica Viva. Once again wearing his trademark “loud” socks, and with his hair untamed, Lane looked the part of the eccentric creative, but his pianism is so exquisite that he really doesn’t need these artistic accoutrements. Lane’s playing perfectly suited the romantic notions of Grieg, and the Chopin he played as an encore. His delicate touch coaxed the keyboard to reach its full potential which he then celebrated with an easy confidence." Piers Lane opened his weekend recital with a charming crop of Schubert Dances, casual little masterpieces that the composer himself would have dashed off at home for the diversion of his friends. For the next two hours, thanks to an intimate venue and the warmth of the Australian pianist's personality, the evening had the enviable aura of a welcoming house concert. Lane did wonders with these Schubertian trifles, cleverly lined up from six different sets of dances. There was the sentimental, the flippant and even the tongue-in-cheek portentous - and all were caught. At one point, 3/4 threatened to morph deliciously into 4/4, thanks to Lane's tempo toying. Spoken introductions were witty and revealing. Who would have expected to hear Brahms introduced as a handsome, tall, blue-eyed young man knocking on Schumann's door ? How many realised there were links between a Chopin Nocturne and one of the composer's Concertos? Brahms' F minor Sonata was given a bravura performance and, in its outer movements, Lane conveyed the composer's frustrations with the mere 88 keys of the instrument; the Andante espressivo was a whispered Intermezzo, an idyll of echoing phrases and subtle rubato. A set of five Chopin Nocturnes included Op 9 No 2, so popular, Lane confided, that it was used on mobile phones. The poise and simplicity of his interpretation made it sound afresh, drawing beautiful sonoroties from the Museum's Fazioli which also obliged with a sonorous storm in the middle of Op 15 No 1. We had been promised a surprise and it turned out to be one of Dudley Moore's "What if?" We were asked to imagine how the Colonel Bogey March might have fared in the Beethoven sonata machine. It was a high-minded hoot, and to say it was a crowd-pleaser would be understatement. Definitely a night at the museum to remember. William Dart (14 July 2009) . Piers Lane offered a magnificent Chopin recital to a capacity audience at the Wigmore Hall. The performances were notable for eschewing empty display in favour of richness and exploring. The first, moderato, theme in Chopin's G minor Ballade was accompanied, as it should be, by detached second, third, fifth and sixth beats as the composer dictates. Many pianists ignore the staccato marking and leave the pedal down throughout but Lane gave appropriate acknowledgement to the composer's directions. The qualities that make Lane's approach to Chopin so successful are the same regardless of whether he's playing a Nocturne, the Barcarolle or the Sonatas. In the pair of Nocturnes, Lane demonstrated marvellous quality of tone, tremendous precision and muscle control regarding the whispering inner voices of the pianissimo passages. Contrasted phrases were brought out in a balanced and beautifully shaped way. Kenneth A. Clifford (2 October 2007) . …Mr. Lane, fresh from his spectacular performance of Sir Arthur Bliss's concerto with the American Symphony Orchestra on Friday evening, handled [Alkan’s]"Quasi Faust" with remarkable facility. He is especially adept at the tremulous Romantic figure reminiscent of pianism from the early days of the silent film, and of the undercurrents in Liszt's transcriptions for piano of his son-in-law Richard Wagner's more white-hot moments. Mr. Lane can play quite loudly and still maintain a high level of tastefulness. Contrasting nicely with this bombast were two Nocturnes (Op. 27, Nos. 1 and 2) of Chopin. These were intoned with the most delicate of touches and the most unhurried of tempos. Mr. Lane only uses rubato sparingly, but his choices of moments for its employment turned out to be achingly beautiful. Finally Mr Lane presented the great ‘Carnaval’ of Robert Schumann. Mr Lane’s rendition was…sensitive, highly styled, intellectual, broadly paced, dramatic, musical. I was particularly struck by this pianist's ability to emphasize the poignancy of the composer pouring his heart and soul into the score as he created character portraits of many of his friends who, as it turns out, were primarily imaginary… His slower, contemplative sections were heartfelt but always limpid, his faster movements always exciting and technically impressive, but not too fast.